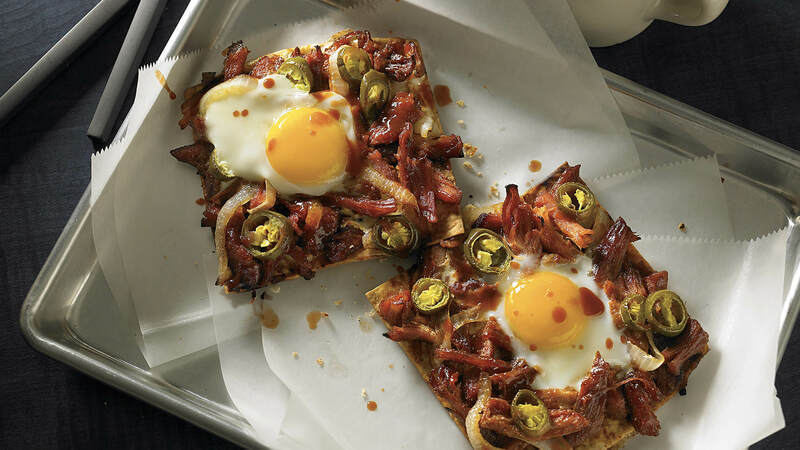 This Southern Breakfast Flatbread recipe piles on eggs, pulled pork and crispy jalapeños for a zesty, comforting brunch dish. There is a growing consumer interest in breakfast versions of non-breakfast foods, such as flatbreads, which continue to increase in menu penetration due to the endless possibilities for toppings and flavor profiles (up by 18% over the past 4 years). Eggs, whole --- 24 ea. Combine TABASCO® Chipotle Sauce, pulled pork and BBQ sauce; warm over medium heat. Lay flatbreads on sheet pans; evenly distribute caramelized onions across all of them. Place warmed pulled pork over top, creating two indentations on each flatbread, for eggs. Crack 1 egg into each indentation. Bake in a preheated 350°F oven until eggs are cooked, approximately 5 to 7 minutes. When flatbreads come out of the oven, garnish with crispy jalapeños.